Surgical repair of total anomalous pulmonary venous connection (TAPVC) can be complicated by the development of pulmonary venous stenosis later on. In addition, the vertical vein, if left unligated, can remain patent and lead to hemodynamically significant left to right shunting. We report an infant who required transcatheter correction of both these problems after surgical repair of TAPVC. Total anomalous pulmonary venous connection (TAPVC) constitutes 1–1.5% of children with congenital heart disease. Surgical outcomes of isolated TAPVC have improved with an operative mortality of as low as 10%, however, postoperative pulmonary artery hypertension can be problematic especially in obstructed TAPVC. Etiology of pulmonary hypertension could range from pulmonary venous hypertension secondary to chronically under filled and small left-sided chambers, pulmonary venous chamber to left atrial anastomosis site stenosis or individual pulmonary vein stenosis to pulmonary arterial (PA) hypertension as a result of large left to right shunt across the patent vertical vein (VV). We report a rare experience of managing both pulmonary venous hypertension followed by PA hypertension by transcatheter measures in a single patient. A 10-month-old boy underwent surgical correction of supracardiac type of TAPVC at 3 months of age when he was weighing 3.2 kg. The left VV was left open at surgery. After an initial uneventful recovery, the child developed shortness of breath, difficulty in feeding, and cough 4 weeks later. Clinical examination revealed tachypnea with respiratory distress, tachycardia, parasternal heave, and loud pulmonic component of the second heart sound. There were bilateral basal crepitations with evidence of mild hepatomegaly. 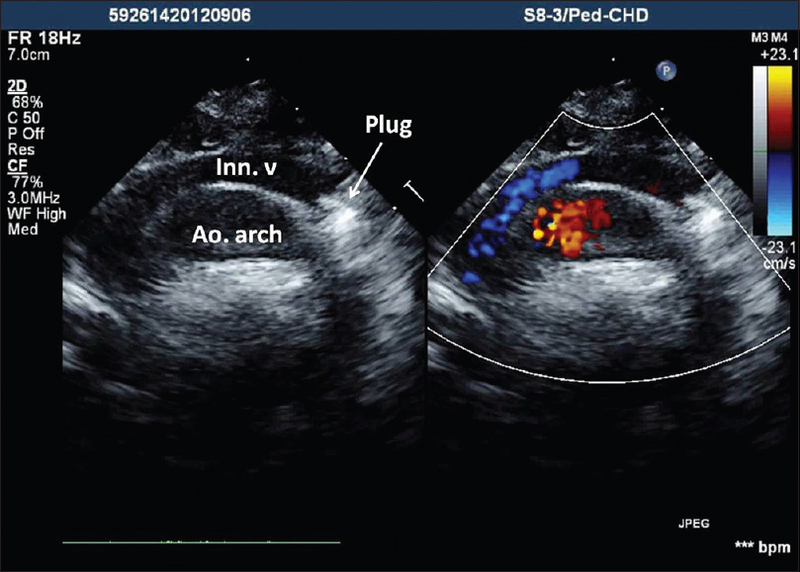 Two-dimensional echocardiography with color Doppler revealed severe PA hypertension secondary to a severe stenosis involving the right common pulmonary vein [Figure 1]. A mean Doppler gradient of 14 mmHg was recorded across this vein. The left VV was patent and draining into the right atrium through the left innominate vein and the right superior vena cava. The patient was taken up for cardiac catheterization with a view to dilate the right-sided pulmonary venous confluence. The right femoral vein was accessed with a 6F venous sheath, and the right pulmonary veins were entered from the left VV through the confluence using a 4F 3.5 Judkins right coronary catheter and a 0.014” BMW angioplasty wire (Guidant Corp., Santa Clara, CA, USA). After recording the pressures, diagnostic angiography with a hand injection of contrast performed in the right upper and lower pulmonary veins confirmed severe right pulmonary venous confluence stenosis [Figure 2]a. 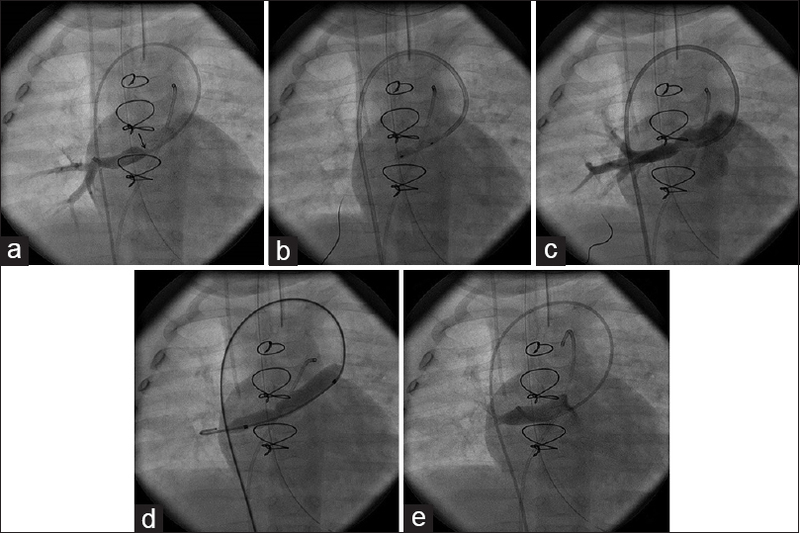 A 3.5 mm × 15 mm Sprinter coronary balloon (Medtronic, Inc., Minneapolis, MN, USA) was positioned across the stenosed segment and dilated [Figure 2]b. As repeat angiography revealed a residual waist [Figure 2]c the 0.014” angioplasty wire was then exchanged for a 0.035” J tipped regular guide wire and a 8 mms × 3 cm Opta ® Pro Balloon (Cordis, Miami, FL, USA) was placed across the narrow segment, and two inflation deflation cycles were performed at 6 atmospheres pressure [Figure 2]d. Repeat angiography and pressure measurements revealed an excellent angiographic and hemodynamic result with the disappearance of the gradient and no residual stenosis [Figure 2]e. The pulmonary artery pressure (PAP) dropped from 80 mmHg to 45 mmHg immediately after the procedure, and the child was discharged from the hospital 48 h later. After a brief period of improvement, the child again became symptomatic with breathlessness, cough, and failure to thrive. He also had two episodes of respiratory tract infections requiring treatment with oral antibiotics. His repeat echo study performed 3 months after the previous intervention revealed that there was no recurrence of pulmonary venous stenosis (PVS). However, there was torrential continuous flow across the left VV carrying blood from the left atrium (LA) to the left innominate vein and then to the superior vena cava and the right atrium. It was decided to close this communication through transcatheter technique as we felt that this left to right shunt was the main contributing factor to the PH and symptoms of the child. Vascular access was through the femoral vein (5F) and artery (4F), and the VV was entered from the venous side. The pressure in the common confluence was noted to be high (mean = 19 mmHg) without any gradient across the right upper and lower pulmonary veins and across the LA to the venous confluence. The PA pressure was elevated (mean PA pressure was 43 mmHg) and about 2/3 of the systemic pressure (mean = 61 mmHg). Administration of 100% FiO2 for 15 min resulted in a fall in the mean PA pressure to 38 mmHg. After occluding the VV with a low-pressure inflation of a 10 mm Tyshak Balloon (NuMED, Inc., Hopkinton, NY, USA), there was a further fall in the mean PAP to 30 mmHg. Angiogram in the venous confluence now incorporated into the LA revealed a left VV measuring 9 mm draining freely into the left innominate vein [Figure 3]a. In view of the favorable hemodynamics, it was decided to close this communication with a 12 mm Amplatzer Vascular Plug II (St. Jude Medical, St. Paul, MN, USA) which was delivered through a 6F Judkins right coronary guide catheter. The catheter was adjusted to avoid blocking the entrance of the pulmonary veins distally and avoid interfering with the entry of the left jugular or subclavian vein into the innominate vein proximally [Figure 3]b. After performing check angiography to confirm proper position, the device was released. The final angiogram revealed near total occlusion of flow in the left VV and unobstructed flow from the left subclavian vein into the innominate vein [Figure 3]c. Follow-up echocardiography a month after the procedure revealed a marked decrease in the PA pressure (mean = 20 mmHg), ventricular remodeling with involution of the right vertical (RV), and total absence of flow in the left VV [Figure 4]. The child has remained asymptomatic and continues to show good growth and development. The latest echocardiogram revealed normal biventricular dimensions and contractility and unobstructed flows across the pulmonary veins into the LA. The early presentation and postoperative pulmonary hypertension have the greatest adverse impact on surgical outcomes after repair of TAPVC. Of these, failure to achieve a low-pressure pulmonary vascular system seems to be the variable that most strongly prevents survival and hence needs to be aggressively tackled. This patient is an unusual case in that he developed two distinct postoperative complications both of which resulted in significant pulmonary hypertension and were severe enough to necessitate a cardiac intervention. Pulmonary venous obstruction ± confluence stenosis is a well-known complication occurring in about 8%–15% of patients after surgical correction of TAPVC. This usually develops within 6 months of primary repair. The site of obstruction is either at the anastomotic site of the confluence with the LA or within the pulmonary veins. It seems that the intimal hyperplasia process probably starts at the anastomotic suture site and extends towards the pulmonary ostia located very close by. The prognosis of the latter as with congenital pulmonary vein stenosis is often poor leading to worsening pulmonary hypertension and eventual death., Even with early treatment, the overall results remain disappointing. The optimal treatment for PVS is yet to be established. Conventional balloon angioplasty, stent implantation, and surgery have all been attempted with limited success.,, More recently, a novel sutureless technique has been introduced for the surgical management of postoperative PVS occurring after the repair of total anomalous pulmonary venous drainage as well as for primary PVS with encouraging results. Fenestration in the interatrial septum has replaced leaving a patent VV as a pop off in the event of left atrial hypertension secondary to small left heart structures. However, a patent VV can be useful for approaching the LA for the purpose of intervention on the pulmonary veins in the event of development of stenosis. The results of balloon dilatation of congenital pulmonary vein stenosis are usually unsatisfactory with frequent suboptimal results or rapid recurrence with restenosis. It is possible that conventional balloon dilatation fails because the area of stenosis is transiently stretched during the procedure without rupture of the intima, which is necessary for balloon dilatation to be successful. Recently, the use of cutting balloons has been attempted with some success. Our patient was unusual in that despite the use of the regular balloon technique; there was no recurrence at short-term follow-up. Perhaps the cause of the stenosis was at the suture line and not in the pulmonary veins and therefore responded well to balloon dilatation. The second unusual feature about our patient was the persistence of the unligated left VV leading to a large shunt and reactive pulmonary hypertension. It is well known that the VV may have to be left open after repair of a TAPVC in children especially in those with preoperative obstruction or whose left heart chambers are small. An unligated VV has been found to reduce PA pressure, decrease perioperative pulmonary hypertensive crisis, and provide better hemodynamics postoperatively. Although these, VVs are expected to close later, they may remain patent in about half of these cases  and rarely may lead to significant and symptomatic left-to-right shunting as was in our case. There have been three prior reports of transcatheter closure of this persistent communication using various devices and coils.,, We decided on an Amplatzer™ plug as it was felt its shape would make it more suitable to totally occlude the tubular VV. Kobayashi et al. used a similar device to close the persistent VV in an infradiaphragmatic TAPVC along with an additional single Gianturco coil deployment to ensure complete occlusion of the communication. We strongly feel that before embarking on transcatheter closure of the unligated vein, it is mandatory to make certain that the hemodynamics are favorable for closure of the communication. The persistent VV sometimes acts as a pop off especially in those with pulmonary venous obstruction or restrictive left heart chambers. Therefore, before we proceeded with closure of the VV at the second procedure, we ruled out any pulmonary venous or confluence stenosis by recording the gradients across the pulmonary veins and confluence in addition to performing pulmonary venous angiography. Furthermore, temporary balloon occlusion of the VV resulted in fall of PA pressure suggesting that at least part of pulmonary hypertension was reactive. Although access to the left VV is not a problem, tracking a large sheath all the way into the vein could be. Therefore, our preference was for a right coronary guiding catheter to deliver the device. Finally, accurate placement of the plug well within the VV is imperative to avoid blocking the pulmonary veins distally and entry of left jugular or subclavian vein into innominate vein proximally. The dramatic clinical response of the baby to closure of the VV vindicated the decision to close it. Ricci M, Elliott M, Cohen GA, Catalan G, Stark J, de Leval MR, et al. Management of pulmonary venous obstruction after correction of TAPVC: Risk factors for adverse outcome. Eur J Cardiothorac Surg 2003;24:28-36.
van de Wal HJ, Hamilton DI, Godman MJ, Harinck E, Lacquet LK, van Oort A. Pulmonary venous obstruction following correction for total anomalous pulmonary venous drainage: A challenge. Eur J Cardiothorac Surg 1992;6:545-9. Lacour-Gayet F, Zoghbi J, Serraf AE, Belli E, Piot D, Rey C, et al. Surgical management of progressive pulmonary venous obstruction after repair of total anomalous pulmonary venous connection. J Thorac Cardiovasc Surg 1999;117:679-87. Devaney EJ, Chang AC, Ohye RG, Bove EL. Management of congenital and acquired pulmonary vein stenosis. Ann Thorac Surg 2006;81:992-5. Driscoll DJ, Hesslein PS, Mullins CE. Congenital stenosis of individual pulmonary veins: Clinical spectrum and unsuccessful treatment by transvenous balloon dilation. Am J Cardiol 1982;49:1767-72. Lock JE, Bass JL, Castaneda-Zuniga W, Fuhrman BP, Rashkind WJ, Lucas RV Jr. Dilation angioplasty of congenital or operative narrowings of venous channels. Circulation 1984;70:457-64. Cullen S, Ho SY, Shore D. Congenital stenosis of pulmonary veins: Failure to modify natural history by intraoperative placement of stents. Cardiol Young 1994;4:395-8. Chowdhury UK, Subramaniam KG, Joshi K, Varshney S, Kumar G, Singh R, et al. Rechanneling of total anomalous pulmonary venous connection with or without vertical vein ligation: Results and guidelines for candidate selection. J Thorac Cardiovasc Surg 2007;133:1286-94, 1294.e1-4. Cheung YF, Lun KS, Chau AK, Chiu CS. 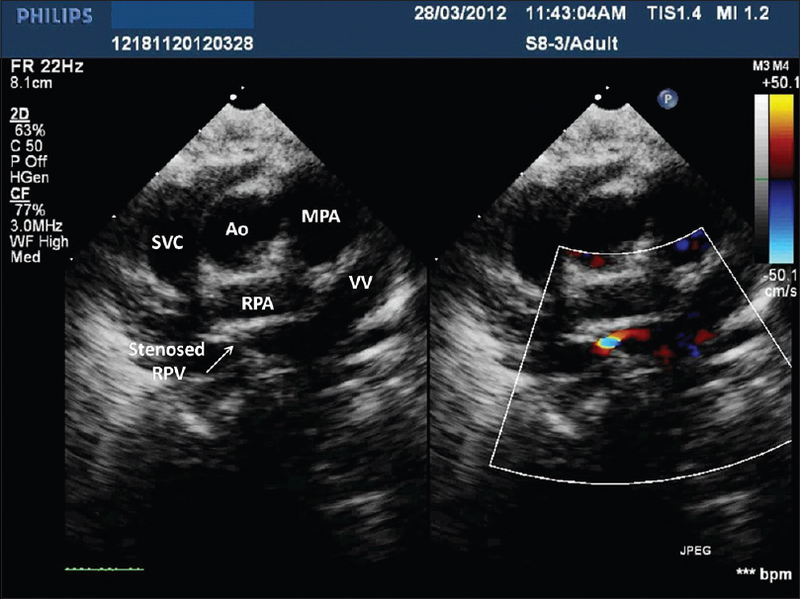 Fate of the unligated vertical vein after repair of supracardiac anomalous pulmonary venous connection. J Paediatr Child Health 2005;41:361-4. Hausdorf G, Schneider M, Hebe J, Morf G, Alexi V, Berdjis F, et al. Combined surgical-interventional procedure in congenital heart defects with postoperative, left ventricular dysfunction. Z Kardiol 1992;81:276-82. 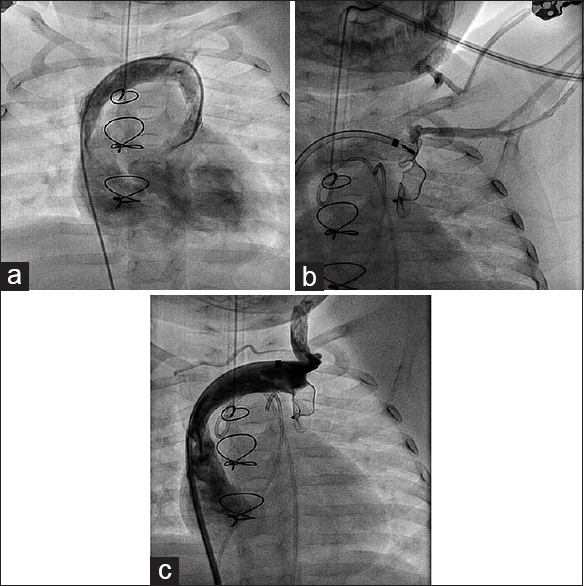 Kobayashi D, Forbes TJ, Delius RE, Aggarwal S. Amplatzer vascular plug for transcatheter closure of persistent unligated vertical vein after repair of infracardiac total anomalous pulmonary venous connection. Catheter Cardiovasc Interv 2012;80:192-8.